The work of Florian Hecker induces a state of mind verging on hallucination: unidentifiable sounds appear and disappear, coalesce and disintegrate, instilling doubt as to what has been heard. Sound is a medium that is conducive to such hallucination: the mind strives to fix and identify the source of what is heard, while sound itself is fugitive and ephemeral. What is heard is already not just sound, but always the memory of sound and the sign of something else. When, as in Hecker’s work, sounds are wholly synthetic, they tend to induce phantom sound sources whose existence owes as much to our own cognition as to the physical waves that reach our ears. As François J. Bonnet puts it, listening often has a fetishistic component: what reaches our ears solicits an active involvement, in which we try to make sense of what we hear, and mould it to our expectations and desires.1 Rather than satisfy this natural tendency to make sense of sounds, Hecker’s synthetic compositions engender doubt and uncertainty. Drawing on scientific studies into the auditory process, he creates synthetic compositions that transform along with the listener’s shifting attention or position within a space, thus producing a participatory dramatization of the auditory process.2 Removed from the laboratory and deployed in a performance space, these techniques produce fascinating, unsettling, and sometimes disorienting effects. The listener has to assume an active part in the performance, assembling an enigmatic multiplicity of elements without any narrative or image to rely on, and ultimately encountering the ‘event’ of hearing itself. A similar fostering of uncertainty appears from the very outset of Stéphane Mallarmé’s poem L’après-midi d’un faune. This strange drama first emerged in the oppressive heat of Tournon, where the poet, far away from the Paris demi-monde, would undergo the ‘crisis’ that led him to radically reconfigure his art. It is a poem in which, in Paul Valéry’s words, ‘an extreme sensuality, an extreme intellectuality, an extreme musicality, combine, intermingle, or oppose each other’. A faun, upon waking, remembers pursuing two beautiful nymphs, and longs to fix their image in his mind: These Nymphs, I would perpetuate them. Yet he is tormented by the possibility that they were merely the imaginary product of his own desire, kindled by the midday sun: Did I love a dream? Unlike that of Descartes, Mallarmé’s ‘method of doubt’ leads not to certainty but to protracted vacillation: as the faun perplexes himself with possible explanations, he becomes entangled in the tenebrous thickets of memory and perception, lost in their ramifying uncertainties: My doubt, hoard of old darkness, ends in a whole stream of subtle branches. No sooner does he wonder whether the nymphs were mere fabulations, occasioned by the sounds of the elements penetrating his dream (the trickling of water, the breeze caressing the foliage) than these elements themselves condense into the music of his own pipes drifting through the afternoon air: not a sound of water but my flute’s outpourings murmurs round the thicket. In a series of vignettes within the poem, the faun then exhorts himself to ‘RECOUNT’, ‘REMEMBER’, and ‘PROCLAIM’ the truth of the evanescent event, telling and retelling it—only to conclude that the objects of this pursuit cannot be captured in reality, but only further intensified by his own desire, stoked by the artifices of art. Doubtless it was the enigmatic qualities of Mallarmé’s poem that led Claude Debussy, a habitué of the poet’s celebrated Tuesday evening soirées, to compose his Prélude à l’après-midi d’un faune, first performed in 1894, and which was to divide audiences. Redolent with uncertainty and ambiguity, flouting musical convention and yet certainly not atonal, from the introduction of the main theme with its tense and questioning tritone to the last moments in which, rather than being concluded, it sinks gently back into silent torpor—an inconclusion which according to the composer ‘prolongs the last line where the faun sinks back into his slumber: Farewell, you two; I go to see the shadow you have become’—Debussy’s composition further cultivates the languorous cadences and arabesques of Mallarmé’s verse. Although Debussy described the work as ‘a free illustration’ rather than an attempt at a direct translation of the poem into music, he succeeds not only in evoking the verdant luminosity of the pastoral scene and the faun’s languid reverie, but also in conveying musically his introspective quest. On the cusp of a wave of ardour (the ‘rising movement’ Debussy noted in Mallarmé’s poem), the piece repeatedly lapses back into diffuse tonal ambiguity, only for its theme to be reprised in a new form—as if miming the faun’s perplexed examination of his predicament from different perspectives. In this series of divagations, delicate timbres and tone-colours are touched on without consummation, as the presiding motif returns, shifting, its yearning for resolution never truly satisfied. Debussy’s piece seems to have initially been conceived as a score for a stage production, comprising a prelude, interlude, and ‘final paraphrase’—a project that was never to bear fruit. But Mallarmé’s poem already had a vexed relation with the theatre: he had originally intended it as ‘a poem for reading or for the stage’, insisting that ‘it is not a work that may conceivably be given in the theatre; it demands the theatre’—an opinion not shared by the directors of the Comédie Française, who in 1865 rejected his proposal to stage the piece.3 Periodically revisited and revised by Mallarmé for over a decade, the Faune was not to see the light of day until 1876—in written form, in an edition with illustrations by Edouard Manet. 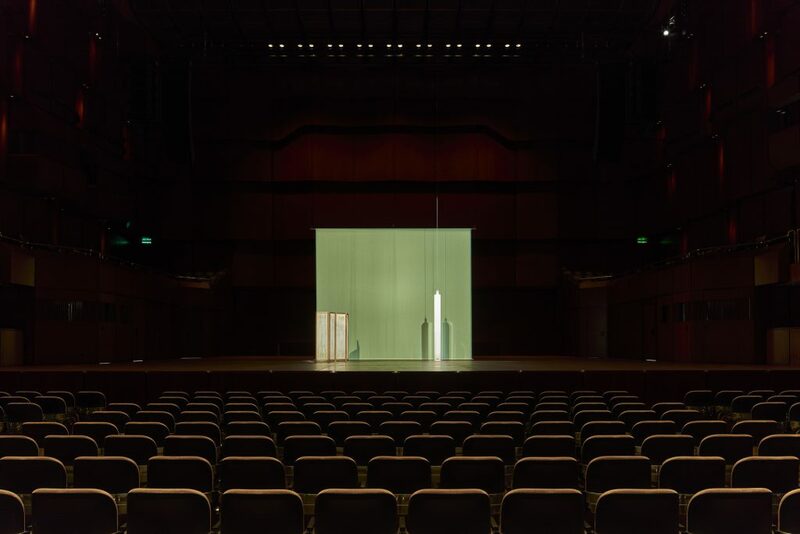 Across art forms and aesthetic dispositions, each of these variations on a theme has refashioned anew the enigmatic figure of the Faun5—a sequence to which Florian Hecker has recently added his own reformulation with FAVN (2016), a performance commissioned by the MMK and Alte Oper Frankfurt as a part of their ‘Musikfest Nachmittag eines Faunes’. With no orchestra, actors, or singers, Hecker leaves the main stage of the Alte Oper almost empty but for an upright loudspeaker (the Faun), a backdrop of bouclé-like fabric, and a coromandel screen. The piece consists of three sound movements diffused throughout the space, accompanied by a libretto recited from the onstage speaker by an electroacoustic voice which, as it cryptically describes the abstract, abrasive sounds that fill the theatre, simultaneously threatens to become itself nothing but sonic matter. In truth, ‘Faun’ is an empty cipher, the name for a process of questioning whose inconclusive development is the real concern of Mallarmé’s poem, in which we, the audience to this drama, are invited to participate, and which the shifting, hallucinatory modulations of Debussy’s Prélude incline us to reiterate: What, if anything, has taken place? How might obscure sensations, once aroused, be ‘perpetuated’? Mallarmé’s Faune seems to suggest that such perpetuation is to be achieved only by renouncing all mundane determination, and elevating desire to the level of art. Nijinsky’s conclusion will be more sybaritic, and frankly fetishistic: having failed to possess the nymph, the Faun finally satisfies himself by coupling with her discarded veil. As for Debussy, his response to Mallarmé’s Faune is more subtle and difficult to decipher; but in fidelity to the poet, the languorous cadences of the Prélude furnish nothing clear or definite apart from the insistent petitioning of the Faun’s flute; and in closing, the ‘rising movement’ and the shimmering textures of sylvan light and shade seem to melt away like mirages as the orchestra lapses into silence. In responding to the Prélude, Hecker has reprocessed the common threads of this extraordinary sequence through his own electroacoustic composition practice, the fundamental concern of which may also be summed up in a question: What did I hear? Which is also a matter of ‘perpetuation’, given that it belongs to the evanescent nature of sound to continually escape us, so that what is heard is always determined once its material cause has already quit the scene. 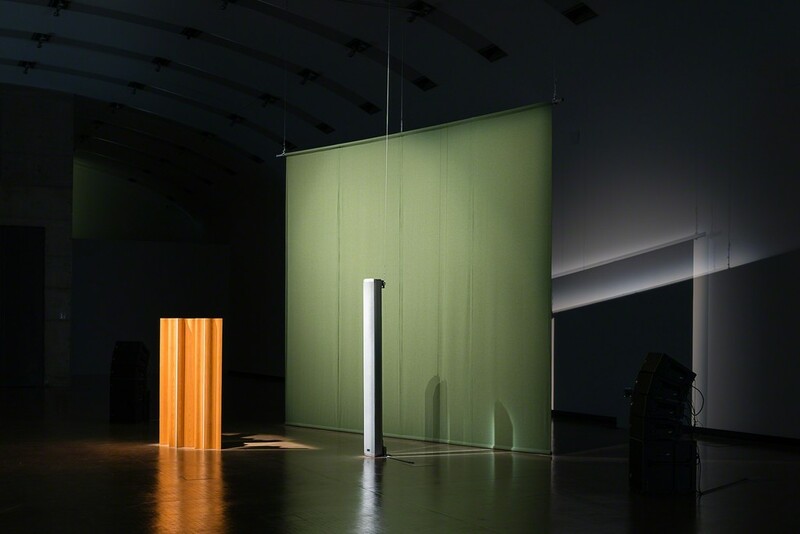 Informed by research into sound and the auditory process, Hecker’s works use a resolutely non-musical vocabulary drawn from psychoacoustic theory and experiment to probe and interrogate, disintegrate and transform the very notion of a ‘sound object’. Although psychoacoustics proposes many different analyses and models of sound, Hecker rarely favours any one approach, instead employing them as an instrumentarium for creating unprecedented sensations. We might indeed say that, in détourning computational techniques designed to analyse sound and hearing, instead turning them into experimental modules for synthesizing new sonorous forms, often chaining these modules together, reformulating the same piece using different methods of synthesis (Formulation DBM), or juxtaposing or superposing fragments from experiments designed to demonstrate competing theories (Event, Stream, Object ), Hecker is effectively constructing thought synthesizers: rather than exemplifying, illustrating, or affirming the sufficient truth of one or another theory of sound, presenting it to be contemplated or thought (as some contemporary artists might), his work uses these models-modules to break theoretical labour out of the textbook and the laboratory, rendering it productive rather than referential,7 a setting which, however elite-modern Hecker’s aesthetic might be, is constitutively impure: namely, the context of human hearing in all its breadth and complexity and multiplicity of function, reducible neither to the simplified control environment of the soundlab nor to the cultural environment, preloaded with codes and formal expectations, of the concert hall. Yet in this new context, ‘Faun’ continues to denote the will to perpetuate transient experience, and to affirm it by way of artifice: for rather than unveiling the objective reality of sound, Hecker’s compositions argue that sensation must be actively constructed in order to be experienced at all. In FAVN, the audience is invited to identify with the protagonist, questioning perceptions, considering multiple hypotheses—and ultimately reaching that irresolute state prized above all by the poet where description gives way to active (re-)creation. We must ourselves ‘integrate’ and ‘perpetuate’ a work that offers no definitive conclusion, but instead activates the contingencies of our sensory organs and exacerbates perceptual equivocation. The work thus takes place not so much on the stage of the Alte Oper (which indeed is all but empty and hosts no ‘action’) as in the intimacy of what Mallarmé called the ‘inner stage’, where ambiguity and absence serve to evoke, between the lines, in the mind of the audience, an Idea that evades explicit presentation (as Mallarmé declares in Igitur, ‘This Story is addressed to the Intelligence of the reader which stages things itself’ ). What is sought in FAVN, though, is not the Mallarméan pure intellectual Idea, but an at once sensate and conceptual grasping of the constitutively synthetic nature of sound. Indeed, Hecker’s Faun speaks in a synthetic voice, constructed by deep neural networks that have captured the specificities of a speaker’s prosody and pronunciation in order to create a chimerical player for this drama.8 Describing the scenography, detailing the movements of the piece and the sensations they excite, the voice also contributes its own ‘verbal music’ to the sonorous texture, soliciting a purely sonic apprehension of its monologue. In this ‘prolonged hesitation between the sound and the sense’ (Valéry), we respond to a voice devoid of the breath of life, a ‘movement in the air’ (Baudelaire) which, nevertheless, invokes the presence of a consciousness capable of meaning. But if, as Mallarmé claims, poetry must necessarily be ‘animated’ by being spoken (if only inwardly), then what kind of artificial life animates these lines? The text, both spoken and read in a leporello distributed to the audience, sets time and space in tension, between the sepulchral stillness of the printed page—or that of digital data—and its sonorous declamation. The complex semantic structure of the libretto, incorporating citations from Mallarmé, Debussy, and others, comprises multiple subordinate clauses folded like a Mallarméan fan, but these ramified depths are at once flattened out and rendered more gnomic by its linear enunciation. FAVN also folds Mallarmé’s insistence on the impossibility of cataloguing the Idea in plain prose onto Hecker’s concern with the ways in which sound is analytically coded, in particular focusing on the concept of timbre—certainly a matter pertinent to the work of Debussy, renowned as the first composer of ‘colours’ rather than melodies, themes, and harmonies, and whose mastery of timbre is exercised magnificently in the burnished golds and sunlit verdancies of the Prélude. 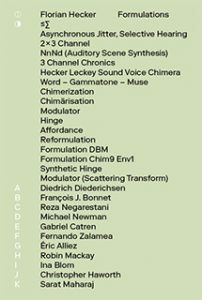 The analysis of timbre—a catch-all term referring to those aspects of the ‘thisness’ of a sound that escape rudimentary parameters such as pitch and duration—is an active field of research today, with multiple methods proposed for classification and comparison. Notably, it is a concern for commercial companies seeking to recommend music based on similarities that may seem intuitive to human listeners, yet remain opaque to formal analysis. Paradoxically, often the timbral classifications that emerge from this research refer to microsonic traits themselves inaudible to the human ear. In FAVN Hecker effectively reverses the analytical strategies devised for timbral description, using them to synthesize new sonic elements: in the first movement, a Scattering Transform with wavelets is employed to produce an almost featureless ground from which an identifiable signal emerges as the texture is iteratively reprocessed to approximate its timbre. Rather than operating via the superposition of simple tones, wavelets furnish a kind of timbral dictionary; in themselves they correspond to nothing that can be heard in isolation, becoming perceptible only when assembled en masse—at which point one hears not distinct wavelets, but an emergent overall timbre. Fully audible in the second movement, the figure that rises from this obscure ground has been generated using an adaptation of Xenakis’s ‘sieve’ method, which modifies signals by subtraction of a numerical subset—Pulsar Synthesis is used to sieve ‘grains’ of sound which, again, only become audible in multitudes. In the third movement, through the use of Distortion Product Otoacoustic Emissions—multiple tones which combine within the ear to produce an effect both auditory and tactile—sound becomes intimately physical. Where Mallarmé’s Faun was minded to ‘seize without untangling’ the two entwined nymphs, here Hecker’s siren songs penetrate the inner ear, as if to finally prove that what is heard is no external object, but a synthetic product of audition itself. In a divergence from Mallarmé’s argument, across the second and third movements the Faun must admit to being itself a sensory artifact, no different in nature to the quarry it pursues. Here again the audience is invited to identify with its predicament, to understand themselves as automaton-subjects constituted by the serial synthesis of sensations, as the enunciation of the libretto flattens out into a mere sonorous continuum recalling Mallarmé’s ‘vain, monotonous line’. Finally the Faun renounces any will to penetrate the veil of perception, instead hearkening to the play of this ‘diaphanous membrane’ for itself. In acknowledging that subject and object are alike ‘spectres’, the Faun is literally consumed by that which it desired. FAVN thus reiterates the troubled duality of Mallarmé’s ‘verbal music’, in between the sense of words and our sensual response to their sonorous materiality. Again with Mallarmé, the piece also does not shrink from demanding the mental exertion required to dispose fragmented perceptions so that they might, to an audience willing to rise to the task, evoke the unspoken Idea. Namely, far from sensation being unclothed and immediate, once the folds of the brain-ear have received, retained, and redistributed what comes to them, ⦶ it will require an effort of thought to strip bare what has been sensed and to take possession of its spectral, synthetic body. In the words of Debussy: How much must be explored and discarded before reaching the naked flesh of feeling…. François J. Bonnet, The Order of Sounds: A Sonorous Archipelago, tr. R. Mackay (Falmouth: Urbanomic, 2016). See my text ‘Skin Games: A Primer’, in booklet accompanying Hecker’s C.D.–A Script for Synthesis (New York, 2013). For an account of Mallarmé’s relation to the theatre, which was more enduring than may be suggested by the oft-recounted anecdote of this échec, see H.M. Block, Mallarmé and the Symbolist Drama (Detroit, MI: Wayne State University Press, 1963). Whereas Mallarmé thanked Debussy graciously for his Prélude—‘it presents a dissonance with my text only by going much further, really, into nostalgia and into light, with finesse, with sensuality, with richness’—Nijinksy’s ballet did not go down so well with Debussy, who dismissed the choreographer as a mathematician who ‘adds up demi-semi-quavers with his feet, [and] proves the result with his arms’! For a fine overview of this sequence, see A.H. Guest, P. Neagu, J.-M. Nectoux (eds), Afternoon of a Faun: Mallarmé, Debussy, Nijinsky (New York: Vendome Press, 1989). On the relationship between Debussy and Mallarmé, see E. Lockspeiser, Debussy: His Life and His Mind (London: Cassell, 1962, 2 vols. ), vol. 1, 150–59. For a musicological analysis of Debussy’s Prélude along with a general background and a selection of source materials, see W.W. Austin (ed. ), Prelude to ‘The Afternoon of a Faun’: An Authoritative Score, Mallarmé’s Poem, Backgrounds and Scores, Criticism and Analysis (New York and London: W.W. Norton, 1970); for a more recent analysis see D.J. Code, ‘Hearing Debussy Reading Mallarmé: Music après Wagner in the Prélude à l’après-midi d’un faune’, Journal of the American Musicological Society 54:3 (Fall 2001), 493–554. For a brilliant philosophical analysis of the poem, which I largely follow here (stopping short of its inevitably badiouising conclusion), see A. Badiou, ‘Philosophy of the Faun’, in Handbook of Inaesthetics, tr. A. Toscano (Stanford, CA: Stanford University Press, 2005), 122–40. A startlingly thorough line-by-line reading and interpretation, with reference to other Mallarmé works, is given in Gardner Davis’s Mallarmé et la « couche suffisant d’intelligibilité » (Paris: José Corti, 1988), 41–137. A full account of the poem’s genesis is given in H. Mondor, Histoire d’un faune (Paris: Gallimard, 1948). Robert Greer Cohn’s reading in Towards the Poems of Mallarmé (Berkeley and Los Angeles: University of California Press, 1965), 13–32, is exemplary in its clarity and, above all, its insistence on retaining, faunlike, in any appreciation of the poem, both its conceptual coolness and its sensual heat. In this sense, Hecker makes a return to the origins of analog synthesis, which developed when electrical signals passing through machines made to model physical systems (i.e. as ‘analogues’) were transduced into auditory signals—see ‘Climate of Bass Hunter’, my sleeve notes to Hecker’s Acid in the Style of David Tudor (Editions Mego, eMego 094, 2009). The voice was created in collaboration with Christophe Veaux, Centre for Speech Technology Research, The University of Edinburgh. It is fitting to give the last word here to a formula suggested by Éric Alliez (personal correspondence), whose remarkable work on the ‘Brain-Eye’ played an important role in the conceptualization of FAVN and the composition of the libretto.